Roger Stone is a big Apple user —and that may be a problem for him, given that Apple has handed over data from his iCloud account in accordance with a warrant. That and more, in the latest Apple-related crime roundup. The latest in an occasional series at AppleInsider: A round-up of Apple-related crime. Following former Trump campaign advisor Roger Stone's arrest last week, the office of Special Counsel Robert Mueller said Thursday that it has obtained numerous electronic devices belonging to Stone, as well as access to his iCloud account. The evidence collected, per CNN, includes "multiple hard drives containing several terabytes of information consisting of, among other things, FBI case reports, search warrant applications and results (e.g., Apple iCloud accounts and email accounts)." Also included in the evidence are bank accounts and the hard drives of the devices themselves. Another former Trump adviser, Paul Manafort also had evidence from his iCloud account lead to major legal trouble in connection with the Mueller investigation. Stone and Manafort were business partners for a time in the '80s. The information provided on Stone is the same type of information that Apple provided from the San Bernardino shooter's device from 2016 after a warrant was served. Unlike the San Bernardino iPhone 5C, a device unlock has not been requested for Stone's devices, nor has one been performed. A 13-year-old boy in Valparaiso, Ind., was arrested and charged with intimidation after he allegedly told Siri on his iPhone that he planned to carry out a school shooting. According to the Associated Press, the student also posted an iPhone screenshot of the reaction to the threat. The boy had told Siri "I am going to shoot up a school," at which point the digital assistant produced a list of nearby schools, which he then posted. After a woman in Boston was abducted from a bar last month, her sister was able to locate her by using Find My iPhone. According to Radar Online, when Olivia Ambrose went missing, her sister tracked her iPhone, eventually helping police track down the missing woman. A beekeeper, known as "Beeman," who lives on the West Indies island of Nevis is offering a year's supply of honey for the safe return of his stolen iPad. According to the St. Kitts Nevis Observer, the man's iPad was stolen from his home in December. Beeman, whose real name is Quentin Henderson, lost countless family photos as a result of the theft, as well as the ability to communicate with friends and family in his native England. In addition to the honey, Henderson is offering $200 in cash. Police in College Station, Tex., successfully subpoenaed Apple to obtain the name of the owner of a stolen iPhone. According to KBTX, police had arrested a 19-year-old man for selling stolen iPhones, and then subpoenaed Apple in order to obtain the name. Apple complied with the subpoena, which led to an additional charge against the accused thief. A man in England spent six days last week tracking the movements of his stolen iPad via Find My iPhone. According to The Sun, the man followed the device through churches, bars, and other locations in London over the course of nearly a week. Throughout, he live-tweeted maps of where the phone was, until he and a friend finally confronted the alleged thief —a homeless man who appeared confused about the situation. A man has been arrested in Central Pennsylvania, after which he admitted that he carried out a scam in which he purchased multiple iPhones by giving fraudulent information to UPS drivers. According to Centre Daily, the New York resident opened false Sprint accounts and bought iPhones in their name. The thefts cost Sprint $200,000, the newspaper said. A pair of teenagers have been charged with stealing 19 iPads and a MacBook from an elementary school in New Jersey. 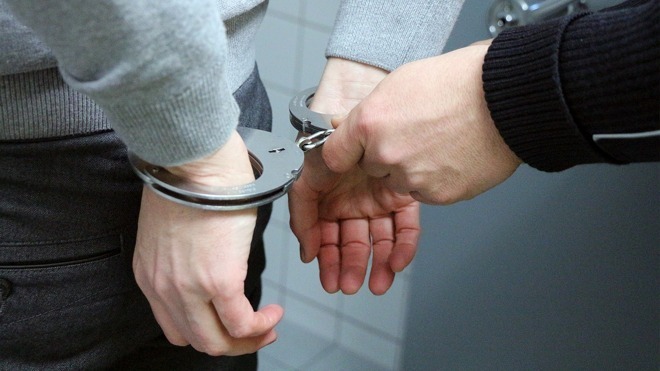 According to The Vineland Daily Journal the two suspects, who are 16 and 19 years old, were charged with burglary and conspiracy to commit burglary, while the 19-year-old was also charged with employing a juvenile in the commission of a crime. The stolen equipment has not been recovered. Two women were arrested in late January and charged with carrying out a scheme in which they met men in Miami Beach nightspots, took them back to hotel rooms, drugged them, and then stole their iPhones and expensive watches. According to NBC Miami, the women were arrested together in a car with the drug GHB in their possession, and have been hit with grand theft, burglary and drug charges. One of the women, the TV station said, was "involved in a similar case from last year." Have a crime story for us? Email AppleInsider and tell us about it.